BBL has gained distinction in the fields of academics as well as in sports and co-curricular activities and remains committed to bring further improvements by introducing innovative concepts and techniques. 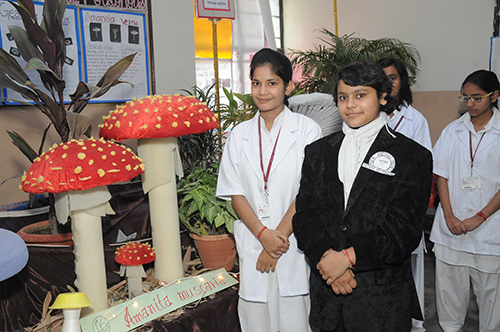 Today the school has become a hub of intellectual intelligence and shares an equal space with the best scholarly institutions of the country. Along with intellectual nourishment it instills in the students a strong sense of nationalism, admiration of Indian art and culture and pride in our glorious past & rich traditional heritage.The school follows TQMS (Total Quality Management System) and is certified by ISO-9001-2015. 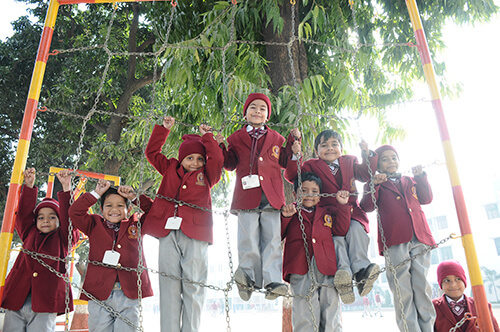 The school is equipped with impeccable infrastructure. The splendid main building, painted in white and greyish blue colour stands out in the western side of the estate. School building being an epitome of architectural dexterity, speaks volumes of aesthetic appeal, fully earthquake resistant, quite airy, with sufficient light and with adequate boundary wall for the safety purpose. Consisting of more than 60 rooms, an auditorium with a stage to perform cultural activities, A.V. Room, Activity Room, Art & Craft Room, Music & Dance Room, W.E. 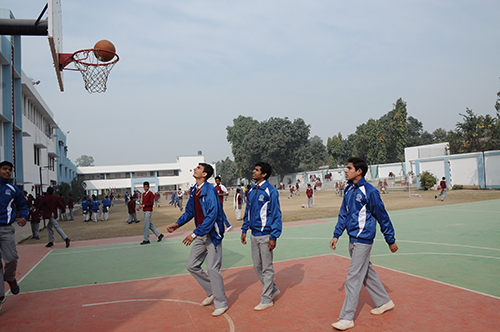 Room, Physics, Chemistry, Bio, Maths & Computer Labs, Library, Games Room, Store Rooms, Canteen and a well maintained games out field with Basketball court, the school also owns a beautiful idol of Goddess Saraswati at the South-West corner of the main entrance of the school. Additions, improvements and maintenance are the regular features so as to keep the infrastructure lively. 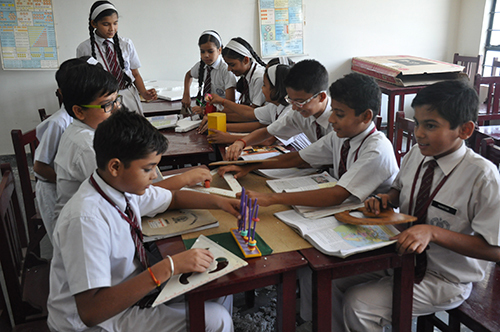 Class Rooms are spacious, specially designed for proper light and ventilation, ergonomic, well furnished, well equipped with smart board, projector, white board along with the CCTV cameras for keeping an eye over the proceedings in the class rooms which also helps in maintaining the discipline. As school provides physical training in Yoga, Aerobics, Gymnastics, Judo-Karate & Taekwondo as well as games like Table Tennis, Basketball, Volleyball, Badminton, Carrom, Chess etc, a room has been provided for storing the required equipments. Provisions for running the fitness programmes and carrying out the camps for students have also been made. For making small kids learn by doing and to teach Nursery Rhymes to the tiny tots with the help of audio visual aids and toys, a specious and well decorated Junior Activity Room has been provided to the students of NC & KG as learning takes place more smoothly by doing than by reading. 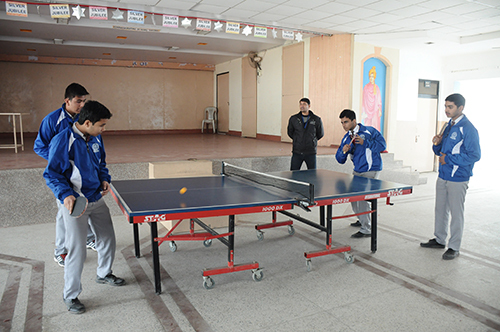 For senior students also, an activity room well equipped with smart board, computer, projector and audio- visual system has been provided in the school. All motivational lectures are arranged here for teachers and students both. 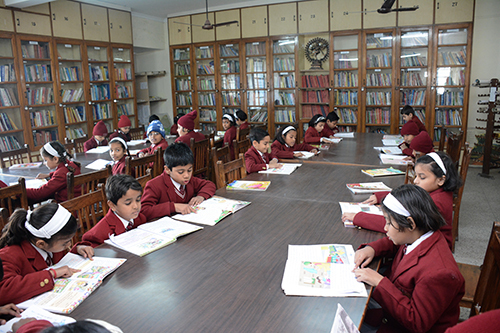 A spacious library equipped with a wide collection of latest & old educational books, including all sorts of magazines and journals, auto biographies, story books, books for current knowledge update and various Hindi & English newspapers has been set up for inculcating the reading habits in students as well as to brush up their knowledge and for streamlining them for competitions. Well equipped & spacious labs for conducting the practicals as per CBSE syllabus in Physics, Chemistry, Biology and Maths along with two Computer Labs fitted with A.C. and a sufficient number of computers have been provided in the school. A spacious and well equipped physics lab has been provided for the students to perform tests and experiments or any research work on timely basis. Junior section students too visit the lab. 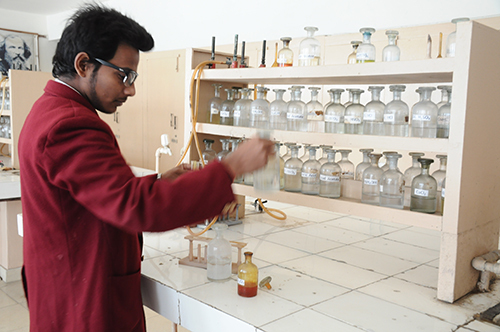 A specious and well maintained chemistry lab has also been provided to the students where they conduct analytical work under the guidance of subject teachers. Lab is supported with separate store where there is a huge collection of chemicals and apparatus. A well maintained and specious lab to perform Bio experiments by the students, equipped with Oven, Refrigerator and LCD TV for explaining interiors of complicated pictures has also been provided. School has also provided a Maths Lab to students for development of their quantitative aptitude for the subject. - School has two fully air conditioned Computer Labs, one for junior students and other for senior students to perform their practicals.